A few years ago I visited the creepy but fascinating Voodoo Museum in New Orleans. I didn’t need to take the tour in order to believe in curses. I myself live under two that I know of. The first one I call the Thickening Curse: there’s almost no point in my trying to make gravy. Or cherry pie. Forget flour, cornstarch, tapioca—I’m telling you, nothing works when you’re cursed. But I’ve never met a brownie recipe I couldn’t ruin. Now I just make them from a box. In the circles I run in, this is beyond shameful. Recently a friend in my writers group ratted me out to the others. From now on I’m in charge of bringing paper products. —The ISBN Curse: Even though you’re sure you checked them in the manuscript, on the page proofs, and on revises, the first time you skip checking ISBNs on bluelines, they’ll be wrong. —The Damned If You Do Curse: If you indulge the author in an iffy construction, she’ll point out the lapse; if you edit, she’ll stet it. —The Pagination Curse: The manuscript you drop on the floor is the one that was printed without page numbers. If anyone knows how I can ward these off (other than by always doing what I’m supposed to do), please send me the spells. We have to take care of each other. But you can keep the brownie recipes. My long-time colleague Joseph G. Peterson is also a novelist whose first book, Beautiful Piece, was published last year by Northern Illinois University Press in their Switchgrass imprint. The book is a stunner, pulling the reader straight into the troubled mind of Robert as he struggles to make sense of . . . we aren’t sure what, in the midst of a suffocating Chicago summer. carol: Joe, you’re a Chicago guy. Talk about Chicago and Beautiful Piece. It’s clear from the chatter online that many of you already have the sixteenth edition of The Chicago Manual of Style, and that you love it. But, you know, at some point you’re going to have to open it. Cracking that gorgeous blue cover is intimidating for good reason: a thousand pages of style, grammar, and usage advice, and we’re supposed to master it in how long? Maybe we could just stand back and admire it a while longer. The transition to a new edition of The Chicago Manual of Style can be overwhelming. We’ve just spent seven years learning the fifteenth, and I don’t know about you, but I wasn’t finished yet. Here at the University of Chicago Press, I’ve been lucky enough to live with both editions for the last year, using the fifteenth to copyedit book manuscripts while helping the editorial team prepare the sixteenth. But even with that head start—or maybe because of it—the issues still tend to blur, and it’s not always easy to remember which is which. —It helps to accept the idea of a grace period. If it’s not practical to switch style manuals in the middle of a long and complex project, don’t do it. We probably wouldn’t, here at the press. If your magazine or journal has its own house style based on Chicago’s, you might make small changes over time as the issues arise and as they apply to your publication. —Keep in mind, too, that no one expects you to read the entire new edition at once and retain its contents. If you’re under pressure to make the switch expeditiously, skim through your favorite chapter first. You’ll be reassured to see that the bones of the Manual are still in place. It’s not as though you suddenly no longer know Chicago style. The documentation chapters (14 and 15) have excellent overviews—in fact, reading just the overviews of all the chapters would be another good way to get started. 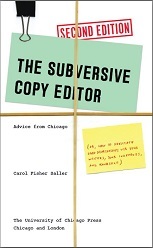 One last encouragement: I believe that the sixteenth edition of CMOS will make copyediting easier. The guidelines are more streamlined and less waffly. Navigation is easier both in print and online. New users will especially benefit from the more intuitive and logical organization of chapters. I just hope we can all relax and enjoy it. Even copyeditors . . .
. . . get vacations. I'm downstate at the motorcycle races (don't ask). I'm sorry I missed you. Stop by again tomorrow; Ill be here. Okay, I know it’s time for me to make a point. And it’s this: Language—even language manipulated by computers—is written by people, and when we write, we have the option of expressing or suppressing attitude, tone, and personality. So far, it’s not that difficult to tell whether we’re listening to a person or a computer, but the gap is closing. When friend and neighbor Clairan Ferrono joined my quilting group years ago, I remember the rest of us cocking eyebrows at the new gal’s weird choices of color, her oddly shaped pieces, and her inability to quilt in straight lines. But we loved her for other qualities and generously ignored her lack of promise. Today Clairan is a fabric artist of international note. Her works appear in museums and libraries, in art books, and in private collections. Luckily, she’s still my friend and neighbor. Every once in a while I visit her studio and chat. ME: Clairan, if readers visit your site, they’ll see that windows feature prominently in your quilts. Riff for me on windows. Readers of this blog may remember my rant against dumbing down. But the idea that we should use formal prose at all times is, not to mince words, absurd. Good writers have more than formal English at their command; they are able to convey personality and color and life in their prose; they use language that fits the venue, whether formal, informal, or slang. The whole point of formal prose is to remove the writer’s personality from text that is appropriately neutral and solemn: committee meeting minutes, laws, technical instructions, religious ceremonies. But to insist on the removal of personality from all writing? Blogging, after all, is about as informal as it gets. We’re having a conversation here, not compiling a grammar textbook. I grew up in Peoria, lived for some years in England, and have been in Chicago now for a good long while. All that is bound to show in my odd mix of locutions. If you’re offended by the occasional ain’t or booger or go on now, git, you’ll have to get yourself another gal. Read this post and others from 2010 and 2011 in Moonlight Blogger. At the CMOS online Q&A , we get questions all the time about the doubling up of punctuation. If a sentence ends with an abbreviation, do you need two periods? If a title ends in a question mark, may a period follow? The Q&A has frequently answered such questions, but still they come. But as a start, I’d like to talk about sentence punctuation versus word punctuation. These two popular types of punctuation serve different purposes. Sentence punctuation marks the progress of a sentence—that is, whether it’s ending or merely pausing. Word punctuation has nothing to do with pacing the sentence; rather it sticks to a word or phrase as part of its spelling. Exclamation point: I loathe you! Question mark: Are you confused? Comma: I like you, but it’s complicated. Semicolon: I like you; is that so complicated? Colon: It’s simple: I like you. Dash: It’s simple—I loathe you! Question mark: Is There Hope? Sentence punctuation (pausing and ending) is simple: use only one mark at a time, and no doubling up. But when words or phrases with their own punctuation move into a sentence, the word punctuation always stays next to the word, which sometimes results in two marks in a row: one for the word, and one for the sentence (whether at the pause or at the end). The car is the Joneses’, but the keys are mine. His favorite movie is Help!, but does he ever help? Abbreviations—such as etc.—keep their periods, even before a dash. Do you know the meaning of op. cit.? —Periods (..), question marks (?? ), and exclamation marks (!!) do not double up. Why? Because that would look weird. —A period never follows an exclamation mark or question mark. If a period collides with one of these at the end of a sentence, the word punctuation wins and the other goes away. Do you doubt that I can finish Is There Hope? At the end of a sentence, a single period suffices, Q.E.D.! Are you going to see Help!? As for pesky punctuation with quotation marks, parentheses, and brackets, ask the folks at the Q&A—they’re smarter than me. The first summer I was legally able to work, I applied for a job as a telemarketer. I dressed up, went to the dubious address downtown, found the dog-eared little walk-up suite, and was told by a man in a greasy tie that I had to audition. Three days later, the company bolted and my star turn ended. It wasn’t a scam—I was actually selling something of reasonable value at a reasonable price, and a paycheck arrived in the mail soon after—but it was my first exposure to the endless scripted politeness we suffer conducting business with strangers by phone or e-mail. And it was nothing compared to what we hear today. Alice: Thank you for phoning BlatherCo. Me: You’re welcome [come on, come on, wind it up]. Alice: We value you as a member/patron/client/service receiver/sucker and we were happy to assist you regarding this matter. My goal was to make sure that you were not just satisfied, but VERY SATISFIED—have I done that? Me: Yes, thanks [not listening, hanging up now . . .]. Alice: It was my pleasure to help you. You may receive an email in next couple days asking you to complete a brief survey about our interaction. It won’t take very long, and it will help us improve our service for all customers. Who has decided that this is good customer service? Executives? Marketers? Laid-off water boarders? And what does my lack of patience have to do with copyediting? Only this: I’ve learned over the years that when you’re beaten down by an editing chore, an author’s complaint, an unreasonable deadline—when you’re so exasperated that patience is impossible—the best remedy is to gripe as long as possible to anyone who will listen. In Being Wrong: Adventures in the Margin of Error, Kathryn Schulz contrasts the embarrassment and deflation of being wrong with that “gleeful little rush when we are right.” Going further, she points out the extra-delicious feeling we have when someone else is wrong—as Schulz puts it, the “triumphant ha!” of the I-told-you-so moment. Tackling questions of truth, being, and the way we experience error, Being Wrong does not dwell on the trivial. Schulz’s hope is that by examining and understanding the experience of being wrong, individuals, corporations, and even governments will learn how to be right. She thinks in terms of world peace. I think more in terms of copyediting. What is copyediting but a thousand little triumphant ha! moments? If we are honest, we admit to the fun part of discovering the errors of others. * We are smart, eagle-eyed, masters of the craft. Nothing wrong with that. But have you ever realized in the middle of editing that an editing decision was mistaken? (I’ll take that as a yes.) Out of nowhere, there’s a realization that we’ve been working under a false impression of rightness. Suddenly there’s a new right answer, and after putting things “right” we move forward on those terms. Schulz believes that experiencing our own errors should be salutary and transforming, rather than deflating or embarrassing. I would add that from erring, we accumulate not only practical learning, but humility, skepticism, and open-mindedness—useful qualities in working with writers and colleagues. In this way, embracing error can be our contribution, if not to world peace, then to peace in publishing. It’s a start. *Let’s forget for now the sickening part of discovering the errors of others: when the errors are so pervasive or deep as to require hours of tedium correcting them, and the triumphant ha! moment becomes a despairing aagh! moment.